But the World Health Organization (WHO) Emergency Committee advised the Congolese Government and all other actors to remain engaged in a “vigorous response” and called on the international community to support efforts on the ground. “Without this, the situation is likely to deteriorate significantly,” read the Public Health Advice issued by the Committee, which also called for global solidarity among the scientific community and for international data to be shared freely and regularly. 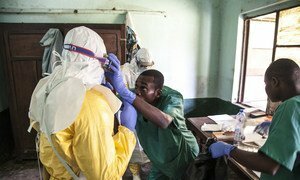 An outbreak of the Ebola virus disease (EVD) was declared in a remote town in DRC’s Equateur province on 8 May. Since then at least one case has been confirmed outside the initial zone. On 17 May, a patient in the provincial capital, Mbandaka, was confirmed as having contracted the disease. The Emergency Committee also decided that if the outbreak “expands significantly, or if there is international spread,” it will reconvene to take further action. Both the site of the outbreak and Mbandaka city are situated on the Congo River, which many consider the “highway” for transport of goods and people in the region where connectivity is otherwise challenging. In its Health Advice, the Committee underscored that while there should be no international travel or trade restrictions, the DRC’s neighbouring countries should strengthen preparedness and surveillance. “Exit screening, including at airports and ports on the Congo River, is considered to be of great importance; however, entry screening, particularly in distant airports, is not considered to be of any public health or cost-benefit value,” it said. The WHO Emergency Committee is composed of 11 international technical experts from various parts of the world, nominated by WHO member States. It is convened under the International Health Regulations – the legally binding international instrument on protection of lives endangered by the global spread of diseases and other health risks. Meanwhile, UN agencies and their partners on the ground have scaled up the response to contain the outbreak and support treatment of those suspected of or having contracted Ebola virus. WHO has also brought in vaccines against the disease, bringing the total number of doses available to 7,500, according to the agency’s spokesperson Tarik Jašarević. However, transporting them to affected areas in a safe and temperature controlled manner is a major challenge as roads are often impassable and electricity is limited. This is the ninth Ebola outbreak in the DRC, a country where the virus is endemic. The virus causes an acute, serious illness, which is often fatal if untreated. First symptoms generally include the sudden onset of fever, fatigue, muscle pain, headache and sore throat. This is followed by vomiting and diarrhoea.